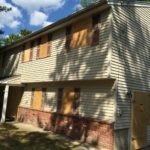 Cardinal Environmental was contacted by the Town of Millbury to provide an emergency estimate for a complete board up of a vacated residential home. We sent the estimate to them within the same day of request. We were awarded the job and immediately began the work. The request was to board up but allow access if necessary by one door to the premise. To meet that requirement we built a hinged door side entrance (see picture directly above) complete with a handle and padlock. 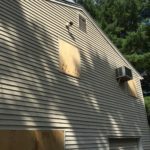 It was necessary that this project be finished as quickly as possible as this house was vacant and the town and surrounding neighbors were fearful of vandalism. Cardinal Environmental worked additional shifts to meet the request. 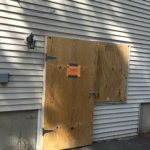 Both the Millbury Building Inspector and the representative for the area Health Department were very pleased with the final outcome.